You'll be £6.80 closer to your next £10.00 credit when you purchase X-Planes. What's this? In this superb illustrated guide, renowned German aviation specialist Manfred Griehl has collected a unique and valuable selection of photographs of Luftwaffe projects that never made it into battle. They remained on the drawing board or at prototype stage either because they were deemed unsuitable or the developers simply ran out of time and the projects never went into production. There are examples of Fw190s developed for the delivery of chemical and toxic weapons, the high altitude Junkers EF 61, the early prototype WNF 342 helicopter as well as numerous examples of developmental jet fighters that could very well have been realised had it not been for the effectiveness of the Allied bombing campaign in restricting the supply of necessary materials. Much of this development work went on to have an important influence on aircraft design in both the East and the West after the Second World War, making this book an essential source not just for those interested in Hitler's Luftwaffe but also in the history of military aviation in general. ... This is a fascinating collection of information, and the author must have spent years assembling the data as so much original material was destroyed or taken away by the victorious allies and as he mentions, hidden away on various archives so that it is now pretty much impossible to unearth. 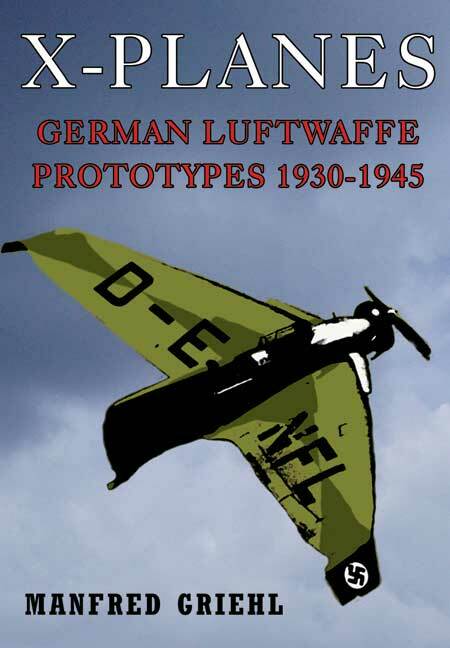 For reference on the many and varied aircraft types designed under the banner of the Third Reich, this is just packed with interesting information for the aircraft historian, modeller and enthusiast. “X-planes” is a fascinating look at an amazing chapter in aviation history. This is a book for the enthusiast; many of the machines described and illustrated will be familiar to historians of the period. Perhaps the most valuable part of this book is the explanation of the complex organisation behind the development and trials of the numerous aircraft that were intended for military and civilian use during the Third Reich. With numerous photographs thorough, is a book for the enthusiast. Perhaps the most valuable part of the book is the explanation of the complex organisation behind the development and trails of the numerous aircraft that were intended for military and civilian use during the Third Reich. By the title alone you know you will like this book and I am pleased to say it does not disappoint once you get inside. This one is a cracker from first to last. The author details the many test sites where development took place and it helps to illustrate the huge amount of effort that went into the growth of German air power. The author draws our attention to the fact that while it could do next to nothing about the manufacturing power of it’s enemies the Luftwaffe made the huge mistake of developing too many types while not sticking to the manufacture of successful models. The book then turns into an illustrated directory of aircraft types. It details them alphabetically by manufacturer showing the types taken way beyond the drawing stage. For the majority this means finished machines, indeed many of which are the production types we all know. However, a great many others are a fascinating mix of concepts and competition designs which did not get beyond the prototype stage. Helicopters and autogyros mix in with the whole polyglot of gliders, floatplanes and sundry jets the German boffins are famous for. This is another of those dip in and out books I really enjoy. Manfred Griehl was a renowned aviation expert and the author of Luftwaffe X-Planes: German Experimental Aircraft of World War II.